A university or college degree is often a prerequisite for a great career. Your child may want to study at post-secondary level in order to acquire the necessary knowledge for exercising a morally and financially rewarding profession. As a parent, grandparent, or relative, you can give your beneficiary the education they deserve by investing in a Canadian Registered Education Savings Plan. You can entrust the management and administration of your plan to the Heritage Education Funds, a foundation that manages over $2 billion in assets at present. A Heritage RESP representative can be contacted online, on the phone, or in a local office. The provider’s home office is in Toronto, but there are branch offices across Canada. You will receive expert consultation and full clarification on your choices. The plan will be designed after careful consideration of your budgetary needs in order to meet your particular requirements. There are many different contribution choices, and you can select the best one with proper guidance. You can make small contributions often or pay annually. Every RESP plan enables you to obtain various government grants, some of which are worth thousands of dollars. One of them, the Canada Education Savings Grant, can give your child up to $500 or $600 every year, until they reach the age of 17. What is more, the Canada Learning Bond awards an initial sum of $500 and an extra sum of $100 every year until your child becomes 15. There are also some grants for residents of Alberta, Quebec, Saskatchewan, and British Columbia. The Alberta grants will eventually be eliminated, but no definitive date has been set for this yet, so you may still qualify. Two of the provincial incentives mentioned above are new. Specifically, the grant offered to residents of Saskatchewan will debut in fall 2013. A beneficiary may receive up to $4,500. The British Columbia grant offers $1,200 per child, who must be born on or after 1 January 2007. An application form needs to be completed when the child becomes 6 years old, and be sent before the beneficiary is 7; it will probably be launched in late 2014 or late 2015. Heritage will be able to provide more relevant information after the provincial governments give notification of their requirements. When your beneficiary begins studying at a post-secondary institution, they will be able to receive Educational Assistance Payments, which are made up of income on principal, government grants, and income on government grants. With the Scholarship Option, the EAPs can be allocated to a student over a period of 1 to 3 years; with the Self-Determined Option, the EAPs are given to a student who attends a qualifying program; in case the beneficiary does not attend such a program, they are awarded an Accumulated Income Payment (AIP). It is worth noting that your RESP savings are tax-free and that makes them more advantageous than any other methods of savings. You can also consider a plan with increased payments and further student savings bonds. An early increase in RESP contributions can also boost your tax benefits and offer you a stronger return. This entry was posted in Education, saving plan and tagged Heritage Education Funds, Heritage Resp on August 13, 2013 by Heritage Resp. There is no doubt that education plays an important role in the future of any child. This is one of the reasons why higher education is so important for the bright future of your child. But with the rising costs of higher education, many parents are finding it very hard to cover the expenses of their child’s education. This is the reason why there are a number of financial assistance programs that have been recognized as an RESP, so that parents would find a way to pay for the higher education of their children. Registered Educational Saving Plan (RESP) is a program that has helped many parents all over Canada to systematically gather the money required for the higher education of their children. If you would like to set up an RESP for your child, you would need to first have the social insurance number of the child and some basic documents. 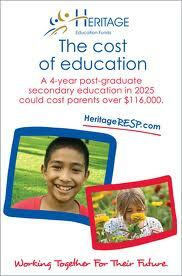 Next you will need to find a suitable RESP service provider like Heritage Education Funds Inc. There are two very important things that you need to keep in mind while setting up an RESP. Firstly, your monthly and annual income, and secondly the number of educational grants programs that your RESP provider is associated with. By keeping in view your monthly or annual income while deciding the options for your child’s RESP, you will be able to set up a Plan which will not be a financial burden on you. A Sales Representative with Heritage Education Funds Inc. will be able to help you with this. Also with Heritage Education Funds Inc.you will not need to worry about other major financial assistance programs from the government,as Heritage Education Funds Inc.is associated with four of the major federal education savings grants run by the government. There are two kinds of RESP Plans that you can select from. The Individual Plan and the Family Plan. If you have only one child that you want to save money for then you can choose the Individual Plan, as only one beneficiary can be added to this Plan. However, in case of multiple children you can opt for the Family Plan where you will be required to set the percentage of contribution that would go to each beneficiary. This entry was posted in Education, saving plan and tagged Heritage Education Funds, Heritage Resp on May 27, 2013 by Heritage Resp. The cost of higher education today is on an all-time high and as per the current trend it seems like the cost would only go higher. The most important question that needs to be answered by parents, guardians, or students is that – how much money should be saved for higher education? It is always good to save as much as possible as the excess of money will never be a problem, it’s only the lack of it that creates a problem. There are many organizations today that offer programs that could help you save money for you or your loved ones’ education. However, there are speculations regarding the reliability of many of these organizations. The government of Canada has introduced Registered Educational Saving Plan (RESP) that can be used to save money for educational purposes. Using RESP you will not only be able to save a substantial amount for further education, but could also receive financial aid from government education assistance programs like Canada Education Savings Grant (CESG), Canada Learning Bond (CLB), etc. Parents who are looking for ways to ensure funds for the education of their children must consider institutions such as Heritage RESP for opening an education savings plan. Opening an education savings plan is not very difficult and only requires some basic documents along with the Social Insurance Number (SIN). Parents who have children below 18 years old can also benefit from Canada Child Tax Benefit (CCTB), since they will be tax exempted for the funds they save every month for the upbringing of their children. Since 1965 Heritage Education Funds Inc. has been supporting Canadian families. Its prime objective from the very beginning was to create an effective education savings plan for the children in Canada, so that they would be able to pursue their desired careers without any financial stress. The Canada Learning Bond (CLB) and Canada Education Savings Grant (CESG) were added to Heritage Education Funds in 2004 and 2006 respectively. Additionally, Heritage Education Funds is also associated with other monetary assistance programs from the government like Alberta Centennial Education Savings Plan (ACES) and Québec Education Savings Incentive (QESI). About: Investing in the Heritage Education Fundcould also help you benefit from financial assistance from the government. This entry was posted in Education, saving plan and tagged Heritage Education Funds, Heritage Resp on May 16, 2013 by Heritage Resp.